Some DesIgn Team Challenge's could not be anymore timelier for me. This week at Hiding In My Craft Room our theme is Weddings, a obvious choice for June. Fortunaly I have the perfect couple to give my creation to. One of my younger brothers, the youngest in fact, are getting married this August. 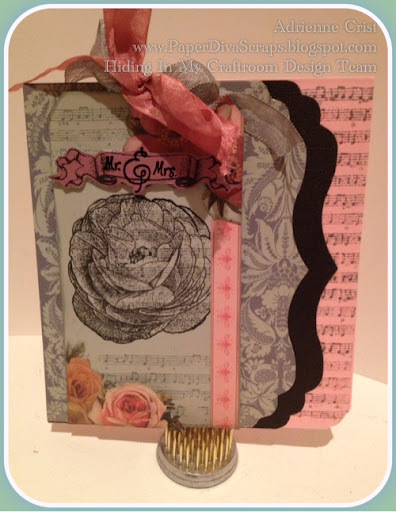 I began with a tag which I punched out with the Sizzix Tim Holtz Bigz die, I used Cosmo Cricut paper. I stamped it with a Donna Salazar rose stamp. I then made a mask and used the outside portion of the mask, I guess that would be considered a stencil because I placed the mask (which I created out of a sticky note)' around my stamped image and the stamped the tag with a Music script Prima background stamp using Grey ink. I did that so the rose would contain the music script stamp and a little boarder of sorts would then appear as a boarder of sorts. After i embellished the tag I then created the card base.